The technique of ultrasonic camera which was designed for the imaging and recognition of finger ridge patterns was applied to material testing. The article describes the princples of the equipment design and the very first results of flaw detection at a brass cylinder are presented. The device is designed to produce 3D Pictures of flaws or structure of biological objects. We hope to achieve such pictures in few weeks. Optel, the company I represent, was established a few years ago on the basis of the idea that a fingertip structure (reflected in fingerprints) can be better analyzed with the use of ultrasound than by existing methods. It turns out that our approach was justified; however its implementation required much more effort than we had anticipated. Nevertheless, we have managed to create fully-operational prototypes of an ultrasonic camera which permit the imaging and recognition of finger ridge patterns. We are well on our way to developing a plan for mass production. A very short ultrasonic pulse is sent from a number of different directions toward a finger surface and from each direction a much longer broadband impulse response is received. This impulse response is an effect of the contact scattering of the ultrasonic wave on the surface of the fingertip. Based on a set of such impulse responses, an image of the finger surface structure is reconstructed using computer tomography methods. In order to create our camera we had to design and make our own ultrasonic devices, for two reasons: devices available on the market were too expensive and did not meet a number of requirements important in our applications. Of paramount importance was that the time skew between different impulse responses be very small (less than 5ns). Equally important was that the ultrasonic transducer should be able to generate a very short pulse (less than 100ns) and should have a sufficiently broad bandwidth as a receiver (4-16MHz). Finally, all elements used had to be inexpensive, since the final product should be suitable for mass production at a reasonable price. Now that we have created elements that meet our needs, it has become apparent that they are suitable for a number of other applications where the use of ultrasonic pulses is necessary, (e.g., classical defectoscopy, layer thickness measurement, medical applications). This paper is intended as a presentation of our solutions for the ultrasonic technology experts. We can offer three elements based on our own design, partially patented, which depending on the software used can be employed to various applications. Ultrasonic PC card, particularly well suited to automatic measurements using mechanical or electronic scanners. It can directly control such devices (it only generates control signals, step motors require an additional driver unit). Pulser and receiver circuit with an active switch and input amplifier, the size of a matchbox, powered and controlled by the ultrasonic PC card. Ultrasonic transmitter, capable of generating very short pulses and having a broad bandwidth as a receiver. Additionally, we can offer our own designs of step motor controllers, power supplies etc. (Full information regarding the above products is available on the Internet *. The PC card comprises not only an input amplifier, a high-speed A/D converter (it has a sampling frequency of 80MHz, a 120 MHz version is under development) but also a control circuit. This means that all control signals required for the measurement process are generated by the card. This kind of design allows us to achieve a sufficiently small time skew between different channels (or scanner positions) which is less than 1 ns. Thanks to the independent control system, the CPU is not directly involved in the measurement process, therefore a high performance PC is not essential. The card has a simple design achieved through the use of highly integrated circuits and can be offered at a reasonable price. Our pulser circuit also provides an inexpensive solution. It is based on a unique design: in order to generate a pulse we first charge the transducer to a required voltage (max. 600V) which takes a few microseconds, then we discharge it in a very short period of time (at the moment this time is around 20ns). This approach results in a simple and inexpensive circuit which generates very clean pulses with practically any transducer (only transducers with a parallel inductance cannot be used). All the electronic circuits we have developed would not be sufficient if we did not have transducers capable of generating very short pulses while having broad bandwidths as receivers. We had tested a number of designs proposed by others as well as products available on the market and we were convinced that there was only one solution: to find a new way. It had to lead to a design which would not only satisfy all the technical requirements but also enable cheap production and repeatable parameters. We have succeeded in developing a transducer satisfying the above requirements for which a patent application has been submitted. Fig. 1 shows a pulse generated by our transducer (a hydrophone made of PVDF film has been used for the measurement, 50 ns/div). Fig. 2 presents the signal received in the transceiver mode (100 ns/div). The difference between the two signals results from the fact that our transducer works differently as a transmitter and as a receiver. This property is also exhibited by other types of transducers, though the differences are usually much smaller. It is possible to develop a transducer which would have practically identical signals in both the transmitter and receiver modes (corresponding roughly to the signal shown in Fig. 1), but it would have certain drawbacks (particularly when used in the design of our camera). Therefore we have decided to use the standard transducers which receive slightly longer impulse response (as shown in Fig. 2). How do the signal level and sensitivity compare with other designs? The signal level generated in the transmitter mode is at least two times higher and the sensitivity in the receiver mode is slightly lower. Hence, the overall signal level in the measurement cycle is comparable. A better sensitivity can be achieved today, however it entails some deterioration of the receiver bandwidth (this in turn can be improved at the cost of the signal level). Since the development of the new transceivers has not been completed yet, we expect considerable improvement. Fig. 3: Schematic diagram of the device. The motor M moves the transducer T around the object S under measurement, sending toward it an ultrasonic wave. Signals reflected by the object are received by the same transducer and processed in a similar way as is done in our camera. Only image reconstruction procedures need to be modified. The device has initially been developed for finger imaging. We would like to see a cross-section of a finger and subsequently a three dimensional structure (using tomographic reconstruction procedures). Using the same device, it is possible to observe other types of objects, both natural and man-made, in order to find material defects. Since the device has just recently been developed, the images it produces are far from perfect. Both reconstruction procedures and the device elements need to be refined. However, it is obvious today that in the future our device will provide a means of high-resolution imaging of internal structures of various objects. Fig. 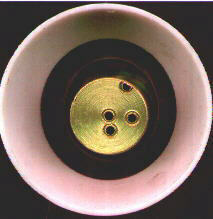 4 shows an image of echoes, coming from a brass cylinder which has 4 holes of 1 mm diameter drilled in it (its view is shown in Fig. 5). Each hole produce an echoe, that could be seen on the picture as a sinus line or a part of it. 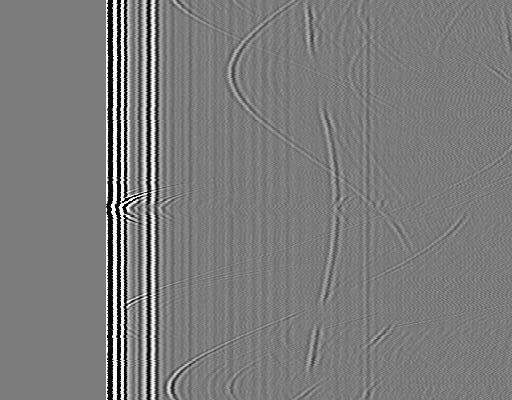 I anticipate that I will be shortly able to present the NDT-Journal readers pictures, that show the internal structure of such a cylinder and are of much higher quality. Wieslaw Bicz et al; Fingerprint structure imaging based on an ultrasound camera, F - A.
Studierte Physik (Spezialität: optische Holographie) in Breslau, lebte einige Jahre in Deutschland (um Frankfurt), wo auch die Geschichte der Fingerabdruckerkennung mit Ultraschall anfing. Geschäftsführer der Firma Optel, die das Projekt zum erfolgreichen Ende bringen will.